In January 1973, National Lampoon ran the above picture on its cover with the caption, If You Don’t Buy This Magazine, We’ll Kill this Dog. It was powerful, dark and hilarious. Most people feel this is the period when National Lampoon began to hit its creative apogee. It was a wildly popular cover and that issue of the magazine remains among the most coveted by collectors. So what does this have to do with voting? Well, perhaps we just need to get a bit more creative to get people to the polls. 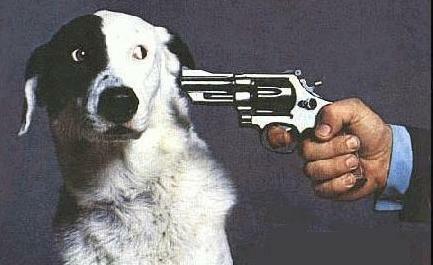 No, I’m not suggesting threatening to shoot the dog. I’m suggesting a referendum on compulsory voting. Yesterday, Corporate Research Associates released an interesting tidbit from their Atlantic Quarterly® indicating over 60% of Atlantic Canadians are either mostly or completely opposed to mandatory voting, while 36% think it’s a good idea. For most politicians, I figure that’s pretty much a deal breaker. If 6 in 10 people are against the idea…then so are they. Many of us in Nova Scotia are only an ancestral conviction or two away from settling under the Southern Cross. Culturally and politically we and the Ozzies are not that far apart. Aside from being worried about ice storms rather than wild fires, most of us could share a beer and find our democratic values fall pretty closely in line*. In Australia, voting is compulsory. After every election the Australian Electoral Commission, will send a letter to all apparent non-voters asking for a valid and sufficient reason for not voting or, in lieu of an acceptable excuse, to fork over a $20 fine. If the voter can’t provide a good reason or doesn’t pony up the 20 bucks, then it goes to court. If found guilty, the voter gets $170 fine plus court costs and could even get a criminal record. The Australians like to say about 95% of the people turn out…but 10% of people aren’t registered, and according to Wikipedia about 6% of the votes aren’t eligible so the real figure is probably closer to 81%. Regardless, it’s certainly better than our record: Federal 2011 – 61%, Nova Scotia 2013 – 59%. This after Elections Nova Scotia bent over backwards to make voting easier. The only thing they didn’t do was show up at your house and hand you the ballot and a pen. Oh, wait a minute...they would do that if you asked them to. There are lots of reasons given for not voting. People say they don’t have time, they’re not interested, they can’t support any of the parties because they’re all the same dirt bags…and so on and so on. There’s a serious problem with that attitude. A considerable amount of blood and treasure has been expended on maintaining the right to vote. We just don’t seem to appreciate the fact. The Australians on the other hand seem understand this principle. Maybe Mel Gibson was just more compelling in Gallipoli than Paul Gross was in Passchendale. Whatever, but by not allowing people to ignore their right and responsibility to vote, the Australians are honouring the sacrifices made by the people who died in the name of democracy and self-determination.. Those sacrifices were real and significant…and horrible. Three years ago I had the privilege of attending a citizenship ceremony in Ottawa. If you ever want to be reminded of some of the values this country stands for and the rights and responsibilities given to each of us as Canadians, turn off Don Cherry and drop into a citizenship ceremony. It makes singing Oh Canada feel pretty good. So…if our downward spiral into apathy toward voting continues, I suggest we give compulsory voting a shot. Even with 36% support as indicated in the CRA poll, the case can be made to draw up regulations similar to those in Australia. If we are to take our electoral results as a baseline, in the recent NS election 56% of eligible voters cast ballots with the Liberals picking up a majority mandate to govern by receiving 45% of the popular vote. That’s only a total of about 25% of all eligible voters. If, as indicated by the CRA poll, we have numbers that would extrapolate to 36% of eligible voters in agreement with the compulsory voting, it’s a slam dunk. Okay…maybe not good logic, but why not have a binding referendum? A direct vote, right here in the birthplace of parliamentary democracy in Canada. All eligible voters must register at least 90 days in advance of a provincial election. This has the added benefit of providing more accurate, current lists for Elections Nova Scotia. If after a defined period following Election Day, Elections Nova Scotia does not receive confirmation of a ballot either cast or spoiled, a letter is sent to the responsible voter to provide a suitable explanation or pay, let’s say, a $50 fine. If neither an explanation or the payment is received by ENS, the file is then forwarded to Service Nova Scotia for collection. Proceeds from fines would be used to fund the once-an-election court process, Elections Nova Scotia expenses and/or streamlining of voting processes. In other words, those people who choose not to vote, for no good reason, would subsidize our elections. If voters disagree with the idea, they can show up and vote against it. I support, with some small reservations, the Australian model which has been in place since 1924, so there empirical evidence of its success. I do wonder, with tongue slightly in cheek, whether the 64% who are against mandatory voting just couldn’t be bothered to give it any cogent thought. The situation is even more dire in voting trends in municipal elections, the government that is closest to the people and delivers most of the services and programs that affect our day to day lives. Many municipal elections draw fewer than 30% voter turnout, a number vastly smaller than the percentage of citizens expressing public outrage over the cost of municipal services and programs. The political class will not get behind a mandatory voting initiative because fewer citizens voting works in their favour, increasing the strength of each vote cast by their respective core base. Indeed voter suppression tactics have become de rigueur in the backroom strategy sessions of the major political parties. Perhaps we should also look at changes to our voting system and move into line with the rest of the world and investigate a system of proportional representation, considered anathema to those who view politics as more about power than governance. Voting may be a responsibility, but I prefer responsible voting. Leave it to the ones who care, whatever % that may be. Spot on Mr Morgan.. Spot on! !